Organizational and regulatory features are sometimes part of the causal background of important technology failures. This is particularly true in the history of nuclear power generation. The promise of peaceful uses of atomic energy was enormously attractive at the end of World War II. In abstract terms the possibility of generating useable power from atomic reactions was quite simple. What was needed was a controllable fission reaction in which the heat produced by fission could be captured to run a steam-powered electrical generator. The technical challenges presented by harnessing nuclear fission in a power plant were large. Fissionable material needed to be produced as useable fuel sources. A control system needed to be designed to maintain the level of fission at a desired level. And, most critically, a system for removing heat from the fissioning fuel needed to be designed so that the reactor core would not overheat and melt down, releasing energy and radioactive materials into the environment. Early reactor designs took different approaches to the heat-removal problem. Liquid metal reactors used a metal like sodium as the fluid that would run through the core removing heat to a heat sink for dispersal; and water reactors used pressurized water to serve that function. The sodium breeder reactor design appeared to be a viable approach, but incidents like the Fermi 1 disaster near Detroit cast doubt on the wisdom of using this approach. The reactor design that emerged as the dominant choice in civilian power production was the light water reactor. But light water reactors presented their own technological challenges, including most especially the risk of a massive steam explosion in the event of a power interruption to the cooling plant. In order to obviate this risk reactor designs involved multiple levels of redundancy to ensure that no such power interruption would occur. And much of the cost of construction of a modern light water power plant is dedicated to these systems — containment vessels, redundant power supplies, etc. In spite of these design efforts, however, light water reactors at Three Mile Island and Fukushima did in fact melt down under unusual circumstances — with particularly devastating results in Fukushima. The nuclear power industry in the United States essentially died as a result of public fears of the possibility of meltdown of nuclear reactors near populated areas — fears that were validated by several large nuclear disasters. What is interesting about this story is that there was an alternative reactor design that was developed by US nuclear scientists and engineers in the 1950s that involved a significantly different solution to the problem of harnessing the heat of a nuclear reaction and that posed a dramatically lower level of risk of meltdown and radioactive release. This is the molten salt reactor, first developed at the Oak Ridge National Laboratory facility in the 1950s. This was developed as part of the loopy idea of creating an atomic-powered aircraft that could remain aloft for months. 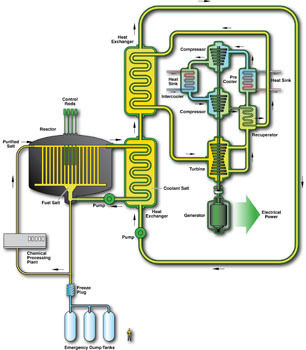 This reactor design operates at atmospheric pressure, and the technological challenges of maintaining a molten salt cooling system are readily solved. The fact that there is no water involved in the cooling system means that the greatest danger in a nuclear power plant, a violent steam explosion, is eliminated entirely. Molten salt will not turn to steam, and the risk of a steam-based explosion is removed completely. Chinese nuclear energy researchers are currently developing a next generation of molten salt reactors, and there is a likelihood that they will be successful in designing a reactor system that is both more efficient in terms of cost and dramatically safer in terms of low-probability, high-cost accidents (link). This technology also has the advantage of making much more efficient use of the nuclear fuel, leaving a dramatically smaller amount of radioactive waste to dispose of. So why did the US nuclear industry abandon the molten-salt reactor design? This seems to be a situation of lock-in by an industry and a regulatory system. Once the industry settled on the light water reactor design, it was implemented by the Nuclear Regulatory Commission in terms of the regulations and licensing requirements for new nuclear reactors. It was subsequently extremely difficult for a utility company or a private energy corporation to invest in the research and development and construction costs that would be associated with a radical change of design. There is currently an effort by an American company to develop a new-generation molten salt reactor, and the process is inhibited by the knowledge that it will take a minimum of ten years to gain certification and licensing for a possible commercial plant to be based on the new design (link). This story illustrates the possibility that a process of technology development may get locked into a particular approach that embodies substantial public risk, and it may be all but impossible to subsequently adopt a different approach. In another context Thomas Hughes refers to this as technological momentum, and it is clear that there are commercial, institutional, and regulatory reasons for this “stickiness” of a major technology once it is designed and adopted. In the case of nuclear power the inertia associated with light water reactors is particularly unfortunate, given that it blocked other solutions that were both safer and more economical.